The Crossfire monitor is the most versatile and innovative master stream appliance ever offered to the fire service. 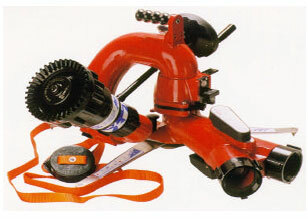 Its lightweight, compact design and unique quick-release swivel joint allow for a faster and safer stream deployment in the portable attack mode. The Safe-Tak 1250 utilizes the revolutionary, patent pending Safe-Tak "flow safety valve". Should the monitor lose contact with the ground surface, the Safe-Tak will automatically reduce flow to the monitor. This safety feature reduces the risk of injury from an out-of-control appliance. Monitor top and base are hardcoat anodised aluminum with TFpowder coat finish inside and out.